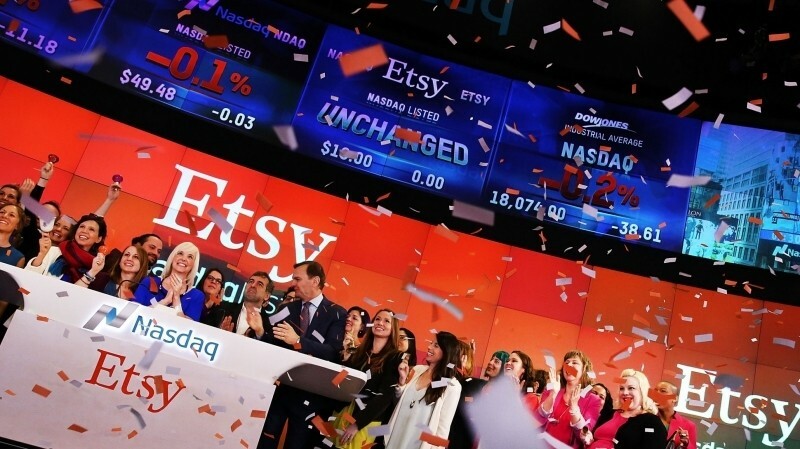 Popular peer-2-peer e-commerce site Etsy finished its initial public offering on a high note. The company priced its IPO at $16 overnight (the upper end of its expected $14 to $16 range) with shares debuting at $31 on the Nasdaq Thursday morning. Share value climbed to nearly $36 just before noon, ultimately ending the day a bit lower at $30. Its performance has prompted some to question whether or not the company priced its shared too conservatively. Etsy got its start in mid-2005, allowing its users to both buy and sell all things handmade. Much like auction site eBay, Etsy earns revenue through listing fees as well as commission on sales. In its US Securities and Exchange Commission filing last month, the company said it has a total of 54 million members, 1.4 million sellers and 19.8 million buyers. Last year, Etsy reported a net loss of $15.2 million on $196 million in revenues. Even still, that was a 56 percent increase over the previous year as CNET notes and with any luck, they'll be able to turn a profit in the near future. In total, Etsy moved $1.93 billion in merchandise in 2014. The company said it will use the money it raises from the IPO for corporate investments and working capital. Part of that will include marketing efforts to attract additional members, creating localized services and forging relationships with third-party service providers.